Summer Deals for Your Next Trip to Walt Disney World! Walt Disney World has released these 3 new deals to add some summer fun and magic into your Walt Disney World trip during the summer 2018 season. Check out this offer and receive a free quote today! 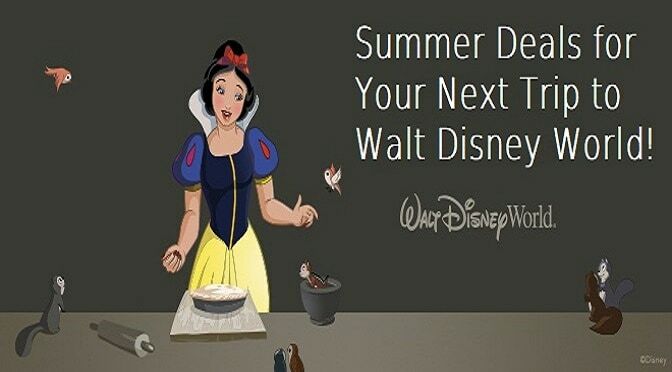 Keep reading this post to discover the 3 new offers you could apply to your Walt Disney World summer vacation! You can get a FREE quick-service dining meal per person (ages 3 and up) per night at a Disney Value Resort hotel when you buy a non-discounted 5-night/6-day room and theme park ticket package. This offer is available to use most nights from May 29-August 25, 2018 when booked by February 11, 2018. Tickets and options must be used within 14 days of first use. First use must occur on or before December 31, 2018. Offer excludes the following room types: campsites and The Little Mermaid Standard Rooms at Disney’s Art of Animation Resort. #2 Soak up Some Sun & Fun – Save up to 20% in Rooms at Select Disney Resort Hotels! If you’re wanting to soak up some sun & fun-filled Disney magic, this Walt Disney World Resort offer may help you to save up to 20% on rooms at select Disney Resort hotels! Offer excludes the following room types: 3-bedroom villas, Cabins at Disney’s Copper Creek Villas & Cabins at Disney’s Wilderness Lodge, The Little Mermaid Standard Rooms Disney’s Art of Animation Resort and Bungalows at Disney’s Polynesian Villas & Bungalows. *Tickets and options must be used 14 days from first use. First use must occur on or before December 31, 2018. This offer will allow a family of 4 to create new memories by enjoying a package that includes a 4-night stay in a standard room at a select Disney’s All-Star Resort hotel and 4-day Magic Your Way base tickets for as low as $1,985. Sample package price is valid for stays most Sunday through Thursday nights April 15 through May 24, 2018 when you book through April 7, 2018. If you’re planning to stay longer or you have more people in your party, ask to check availability for packages that can accommodate other lengths of stay and party sizes. View sample rates based on a 4-night stay in a standard room or studio with 4-day tickets for a family of 4 within the chart below. Price based on 2 adults, 1 junior (ages 10 to 17) and 1 child (ages 3 to 9). Tickets are valid for one theme park day and must be used within 14 days of first use. Previous PostUniversal Orlando provides some information on things in store for 2018Next PostHow a Father and Daughter rode every ride in Disneyland Resort in a single day. Do you think they will release more passholer resort discounts for the summer? The last two years they released the discounts for late spring/summer dates by January 12th. These don’t seem like very good discounts for May. Do you think they will come out with another discount?? What happened to the Disney Visa discounts?